The earliest recorded site in the parish is at Frimstone Carrstone Quarry (NHER 41936), where a number of prehistoric pits and artefacts such as scrapers and arrowheads have been recovered. A very large number of prehistoric objects have been recovered, including some from the Mesolithic period, such as an axehead (NHER 13335), a macehead (NHER 14878) and other tools (NHER 21822 and 21824). A large number of Neolithic period objects, which range from flaked axeheads (NHER 1491, 14218 and 17788), polished axeheads (NHER 1492, 11251 and 1501) to a stone macehead (NHER 1500) cores (NHER 1666) and uncommon pottery sherds (NHER 1667 and 1688) have also been found. Laurel leaf flakes (NHER 14879) have also been recovered, as well as leaf-shaped flint arrowheads (NHER 25912, NHER 40527). Three possible Bronze Age round barrows or ring ditches are recorded (NHER 1668, 43392 and 39824) from across the parish. A large number of Bronze Age objects have also been recovered. Axeheads from a hoard were first recorded in 1797 (NHER 1504), with more axeheads and some spearheads recovered in the 1930s (NHER 1670). Further discoveries of a razor, sword fragments, a chisel, gouges and axeheads were made in 1948 (NHER 1671), with the final substantial parts of the hoard recovered between 1962 and 1986 (NHER 1672). The hoard also contained copper alloy and lead ingot and metal cake fragments. In 1990 a second hoard of Late Bronze Age copper alloy and lead cake ingots was also recovered in association with part of a Late Bronze Age axehead (NHER 25920) in very close proximity to part of the earlier hoard (NHER 1672). It seems likely that this too forms part of the larger hoard. It is thought that a single owner or group of owners deposited them all over a relatively short period of time. A separate Bronze Age hoard of thirty-eight copper alloy objects included axeheads, spearheads and sword fragments (NHER 28136). Earlier finds of a spearhead and two axeheads (NHER 1679) and a spearhead (NHER 17665) from the same area may have been part of this hoard. Large quantities of individual Bronze Age objects have also been found. These include a number of interesting pieces such as four socketed spearheads (NHER 1475, 17192 and 23737), three palstaves (NHER 1505, 1506 and 14415), three awls (NHER 24583, 31666 and 37675) a possible copper alloy ingot (NHER 1507) as well as a barbed and tanged flint arrowhead (NHER 14878) and a small number of pottery sherds (NHER 1677). The density of individual finds, as well as the presence of the hoards, indicates that metalworking and associated settlement, took place in this area. A large number of cropmarks have been recorded in Snettisham, including Iron Age to Roman field systems (NHER 13072 and 26630), enclosures (NHER 21846 and 26820), possible structures and pits (NHER 28450), as well as settlements (NHER 27735 and 26626) and possible kiln structures (NHER 38289). One of these settlements is particularly extensive (NHER 26626), and includes field systems, droveways, enclosures and linear pits and ditches. 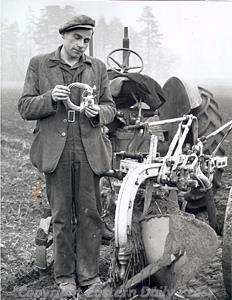 The finder of the first torcs to be discovered at Snettisham in the 1940s with a group of torcs. © Eastern Daily Press. The largest collection of Iron Age torcs in Western Europe has also been found in the parish. 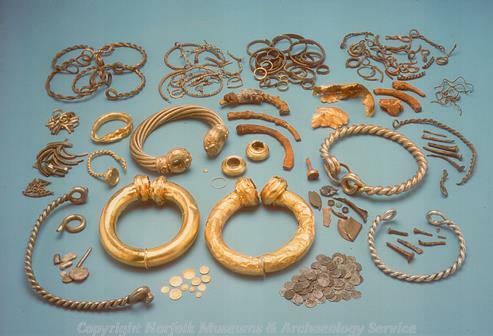 Between 1948 and 1990 nearly 180 torc fragments were recovered, as well as over 100 ingot rings/bracelets, and 170 coins, ingots and metal objects. These may represent the raw materials and finished pieces of a metal worker, or a religious offering (NHER 1487). A hoard of Iron Age coins was found in 1987 and 1988, comprising 82 gold coins and three silver coins (NHER 23504). Individual East Anglian Iron Age gold (NHER 23763) and silver coins (NHER 25184 and 29375) have been recovered from other areas of the parish, as well as coins minted outside the local area by the Trinovantes (NHER 29664 and 31581). In addition an extensive selection of objects have also been recovered. These include pottery sherds (NHER 1544, 22010 and 36989), a brooch (NHER 1673), an enamelled terret ring (NHER 2779), an enamelled horse-trapping fragment (NHER 29376), and a cast copper alloy strainer bowl spout in the form of an animal or fish head (NHER 34531). Many of the Iron Age landscape features such as the field systems discussed above appear to continue in use during the Roman period (NHER 28450). However, field systems (NHER 36126), enclosures (NHER 1691 and 30303), ditches (NHER 18236 and 41123), linear features (NHER 30304) and possible trackways (NHER 26630 and 26634) established in the Roman period have also been noted. In addition, two probable Roman saltern mounds (NHER 26624, NHER 26625) have also been recorded. The above sites are largely known only as a result of aerial photography, but excavation has resulted in the discovery of a number of more substantial Roman period features, and offered us a rare insight into occupation during this period. In 1950 part of an area (NHER 1515) of Late Iron Age to Roman settlement (NER 26626) was excavated and a possible kiln and metal working site was recorded. Work on another part (NHER 1555) of this larger settlement site (NHER 26626) in 1989 also recorded part of a Roman settlement with five phases of occupation from the 1st century to the 3rf century AD. It is thought that a small roundhouse and enclosure grew into a large domestic site with craft, industrial and farming activity taking place. Situated away from this area is the site of a Romano-Celtic style shrine with carstone foundations (NHER 40503). Evaluation of the area identified that the building had plastered walls and a tessellated floor, and a large number of metal objects, pottery sherds and animal bones have been recovered from the area. Perhaps the most well known site is Park Piece Roman villa (NHER 1514), the buried remains of a Roman villa situated above the river and partially excavated in 1931 and 1972. This substantial masonry house had a mosaic floor thought to indicate high status occupation, and was occupied between the 3rd and 4th centuries. A geophysical survey indicated that the villa sat within a complex of intersecting boundary ditches, enclosures and anomalies indicative of industrial activity and possibly metal working, as well as possessing possible defensive ditches. Considering the density of settlement evidence it is probably not surprising that an extensive number and variety of objects have been recovered from the parish. This includes pottery sherds from fifty separate sites (NHER 1513, 14059 and 25797), as well as brooch fragments from seventeen sites (NHER 19118, 24580 and 29372), and coins from fourty-nine sites. These included coins minted under the emperors Vespasian (NHER 31582), Hadrian (NHER 1524 and 9377) and Constantine (NHER 14649), and the empresses Julia Mammea (NHER 16479 and 19515). Of particular interest is a Roman jeweller’s hoard (NHER 1517) recovered in 1985 and comprising 110 unmounted gemstone intaglios, silver jewellery, an unfinished gold ring, silver ingots, and fragments of gold and silver. 110 coins were also recovered, along with tools, and it seems likely that the hoard was deposited here for safekeeping, rather than as a religious act. A variety of other Roman objects have also been recovered from the parish, and these include bracelet fragments (NHER 23521 and 37675), a copper alloy bowl escutcheon (NHER 24058), steelyard weights (NHER 24583 and 40420), a copper alloy vessel (NHER 29658) and personal objects such as hair pins and finger rings (NHER 31666 and 37254). Roman period occupation in an area to the southeast of Snettisham village (NHER 1531), which has been dated to the 2nd to 4th centuries, is thought to continue into the Early Saxon period. A large number of Early Saxon pottery sherds, as well as metal working debris, a comb and brooch fragments have all been recovered from this area. To the north of the village, a possible Early Saxon cremation (NHER 1529) comprising a pottery bowl, charcoal-stained earth, cremated human bone and piece of fused copper has also been recovered. A number of Early Saxon objects have also been recovered, including three brooches (NHER 19118, 23522 and 22010), a strap end (NHER 24203), a blue glass bead (NHER 28102), and a sleeve clasp (NHER 1503). However, no other Saxon period monuments have been discovered, and the dense pattern of occupation and exploitation of the landscape that has been noticeable from the Bronze Age to the Roman periods seems to come to an end. Barring a single coin (NHER 24547) and a strap fitting (NHER 37675), only pottery sherds (NHER 1490, 12547 and 22010) have been recovered from the Middle Saxon period. Late Saxon objects are slightly more abundant, with pottery sherds (NHER 1521, 20214 and 24584), a Late Saxon or early medieval lead spindle whorl or weight (NHER 24056), a brooch and other dress fittings (NHER 25796), a bell (NHER 29373) and a Ringerike styled decorated buckle (NHER 29871). Snettisham is listed in the Domesday Book of 1086, where a number of salt works and mills are mentioned as well as large numbers of livestock, and the parish is highly valued. Although there is no mention of a church, by 1300 building work had taken place on the current site of St Mary’s Church (NHER 1582). This work was incorporated into the transept walls of the current large cruciform building. It is in the Decorated style of architecture, and there is a very rare example of a 13th century sanctus bell in the nave. Very few other medieval structures survive, although the remains of Snettisham Lodge Hill tower (NHER 1539) are probably medieval in date. During the medieval period occupation and exploitation of the landscape increased, and evidence of this is predominantly visible as cropmarks or earthworks. These are largely ditches (NHER 38285, NHER 26809), field boundaries (NHER 26811) and enclosures (NHER 27736), although medieval ridge and furrow (NHER 26812) has also been noted. Several saltern sites have also been recorded (NHER 26813, NHER 26799), as probable sea and flood defences (NHER 26803). The majority of these features are thought to have continued in use during the post medieval period. Medieval objects have been recovered from across this parish, with pottery sherds (NHER 1532, 20215 and 29541) discovered at thirty individual sites and coins from eleven sites (NHER 1537, 31245 and 45441). Objects of particular interest include a copper alloy cauldron leg (NHER 11983), a lead papal seal of Martin IV (NHER 15488), a late medieval limestone corbel (NHER 16120) and a large 14th century copper alloy brooch or buckle (NHER 24581). Perhaps the most prominent building in the parish during the post medieval period, barring the church, was Snettisham Old Hall (NHER 1561). 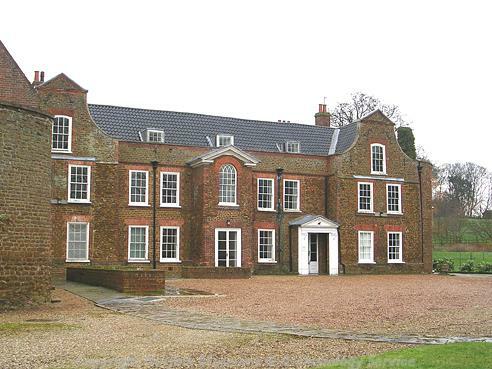 The current building dates largely to the 17th century, though it incorporates a late 16th century manor house. The earliest work may have been by Sir Wymond Cary or his heir, who bought the manor from James I in 1614. Between 1710 and 1835 it was occupied by the Styleman family. In 1871 Old Hall estate was sold to Sir Edward Green, who in 1878 to 1880 had Ken Hill House built as a retreat (NHER 13188). This building is of national importance as the first major provincial example of the ‘Queen Anne’ style, and the original fittings of the game larder survive today. There are also several other buildings of architectural interest which include Manor Farmhouse, which is a 17th century building of carrstone and brick (NHER 13186) and the 17th century Rose and Crown Public House (NHER 13187). Lodge Hill Farmhouse (NHER 22561) also dates to the 17th century, and it is thought that a series of underground brick chambers and tunnels, probably built in the 17th century to filter water, are also present nearby. A large number of interesting buildings also survive in and around the village, and these are particularly concentrated on Hall Road, for instance at No 1 (NHER 46932) and Nos 9, 11 and 13 (NHER 46849), as well as Lynn Road, for instance at Hope House (NHER 46852) and The Hollies (NHER 46854). Industrial remains include the Water Mill (NHER 8312) of around 1800 survives, as does a blacksmith’s and wheelwright’s forge (NHER 20994), which in 1995 was complete with tethering rings, a tyre forge and wheel plate. Of a similar period is the County Primary School (NHER 39334), constructed in 1895 with additions in 1895 and 1908 and of carrstone ashlar and Bath-stone dressings. In addition to these buildings, a number of earthworks also survive across the parish. These include a number of post medieval or undated sea defence banks (NHER 26628, 26631 and 26641). From the 20th century the site of a Tramway (NHER 13757) has been recorded. The Etna Stone and Shingle Co Ltd had a narrow gauge tramway in operation from the 1920s. In 1959 the tramway closed and gravel extraction on the site stopped, but the route of the tramway is known from aerial photographs. World War Two also left its mark on the parish. Although the majority of the minefields (NHER 26637 and 26615), buildings (NHER 26627) and camps (NHER 26618) are no longer visible, some buildings survive. These comprise anti-tank cubes (NHER 32386), a Home Guard store or shelter (NHER 32390), some World War Two buildings (NHER 26647 and 26648) and defensive earthworks (NHER 26804). The site of a World War Two, and possible Boer War, military site and gunnery school (NHER 23145) is also noted, and it is thought that some of the military earthworks and structures still survive in what is now a coastal park.